Chicks might look all cute and fluffy, but aggression is relatively common when they live in groups. If you don't take action and make some changes, pecking can quickly become a serious problem that endangers the lives and well-being of all the birds in the coop. Chicks are more likely to peck on each other if their space is overcrowded. How much space your group needs depends on a number of factors, but as a general rule, each chick needs 8 square feet of outdoor space and 4 square feet of indoor space. If pecking is still happening, you might need to add fixtures to their living arrangement that will create partitions where they can escape to for some alone time. For example, adding boxes or perches will allow individual chicks to have their own spaces when they need them. Make sure you add multiple food and water stations as well -- chicks can become possessive about food, especially if sharing space with a large group of animals. Making sure the brooder is comfortable helps preventing pecking. Keep lighting dim to help calm the chicks. You should also keep the temperature inside the coop comfortably low -- warm temperatures can increase aggression. 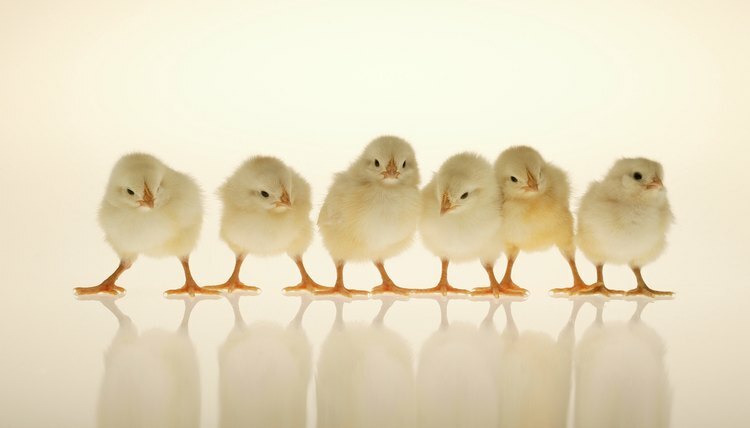 Chicks need a constant temperature of about 95 degrees Fahrenheit when they are about a week old. You can reduce that temperature by 5 degrees per week until they are 9 weeks old. By then -- and from then on -- the brooder temperature should be around 65 degrees Fahrenheit. This is the minimum temperature needed to keep chicks healthy and safe. If you notice any injured or weak chicks, separate them into a brooding area immediately. Chicks will bully sick animals, fostering aggression among the entire group. Separation is especially important if the injury is bleeding, as other chicks will detect blood and increase the intensity and frequency of attacks. Chicks can recognize one another individually. To avoid pecking and aggression problems, don't do anything that will change the color or look of a particular animal. For example, don't mark a chick with red or pink nail polish to tell them apart. This signals to other chicks that this one is different, and might trigger pecking. In addition, when raising chicks of different colors, keep equal numbers of each color to avoid one or two being oddballs. If you have to add new chicks to the flock, try not to disturb the color balance. Nutrena: How Much Heat Should Baby Chicks Have?